The first picture shows the bridge of the Mikasa. I climbed up there. There was a copper plate that is in the second picture. This plate was made from a famous painting and it was exhibited inside. I'd like to have taken a picture of it, but it was prohibited. I found an illustration of the painting on the internet and am showing you it here. You can see some people in the illustration. The top four officials of the Mikasa are drawn in the center of the illustration. Their position on the deck was pointed out with four plates. The nxt three pictures are the instruction board and the plates. 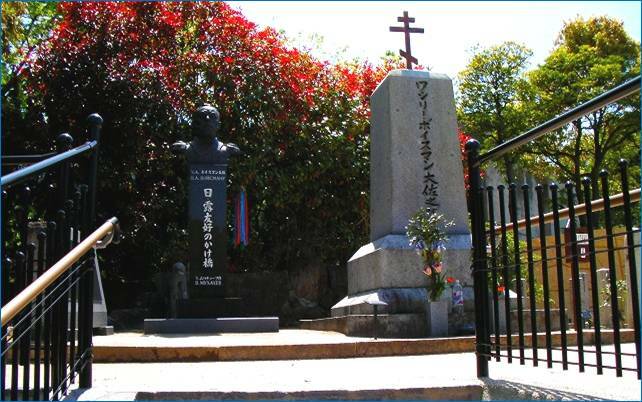 Picture no.4 is of Saneyuki Akiyama, who was from my hometown and was a hero on the sea. Picture no.1 is of Admiral Heihachirou Togo, who is one of the three greatest admirals in the world along with Admiral Nelson and John Paul Jones. The last picture is mine. I'm standing in the spot of Saneyuki Akiyama. 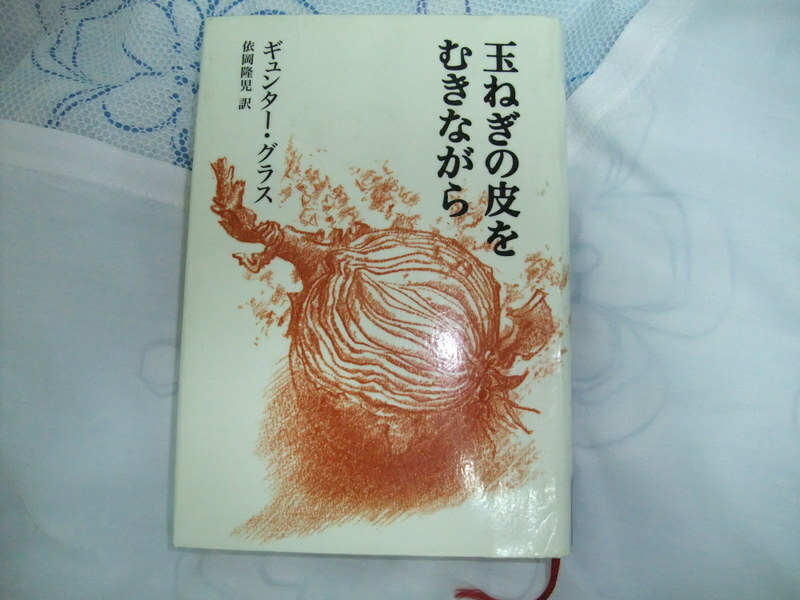 The title of the drama that I related in the last entry is "Saka no Ue no Kumo". My office is located in the center of the city. Nearby is the modernistic Saka no Ue no Kumo Museum, designed by Ando Tadao and dedicated to the novel "Clouds Over The Hill" by Shiba Ryotaro, which tells the story of the local Akiyama brothers and their roles in defeating the Russians in the Japanese-Russo War (1904-1905). 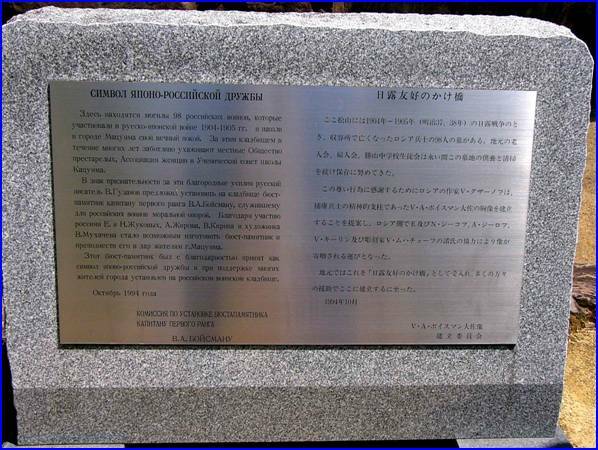 A footnote to this conflict is the Russian Cemetery near Raigoji Temple with the graves of 98 Russian soldiers, of the around 6,000 Russian prisoners, who were held with a fair amount of freedom in Matsuyama. They could enjoy walking just about freely in the city and bathing at Dogo Onsen Spa, which was noted for the oldest hot spa in Japan. Some got married and started businesses. Russia was informed about this treatment and finally Russian soldiers got to shout "Matsuyama" when they waved the white flag. Though Russia took a few hundred thousand Japanese POWs into custody and they were treated inhumanely in Siberian labor camps, the Russian soldiers' cemetery has been kept clean and tidy for a hundred years by people from the neighborhood and the junior high school students nearby. I'd like the present Russian people to know this fact. The last five pictures are of the Russian cemetery. 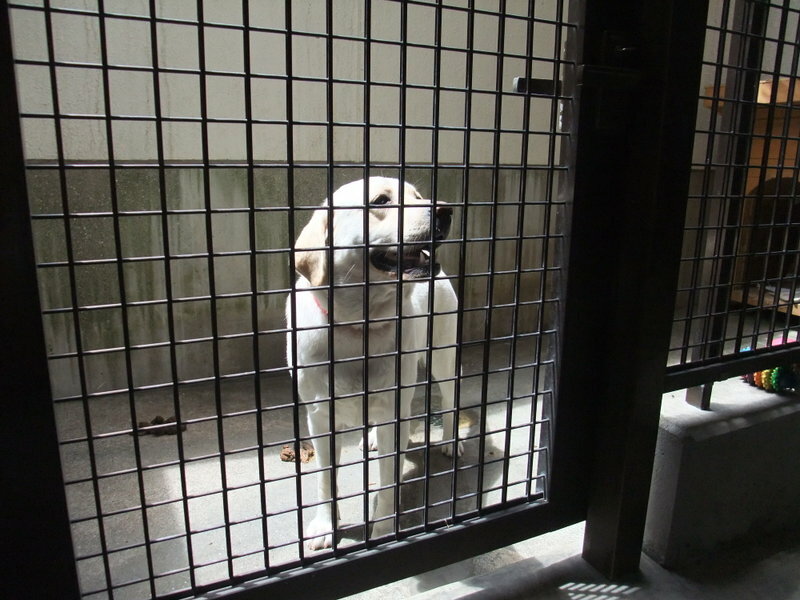 I was shocked by the inhumane conditions. 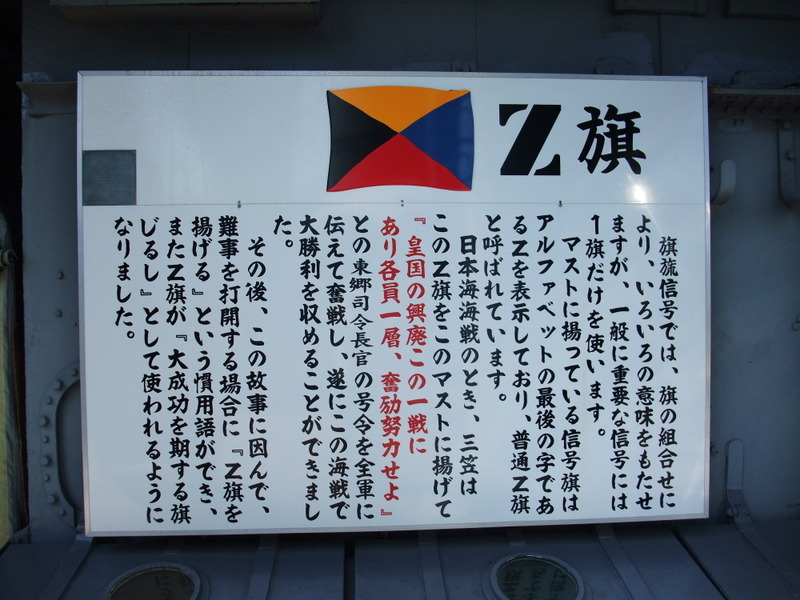 The title, "Flag Z", is my translation of a Japanese phrase, "Z旗". 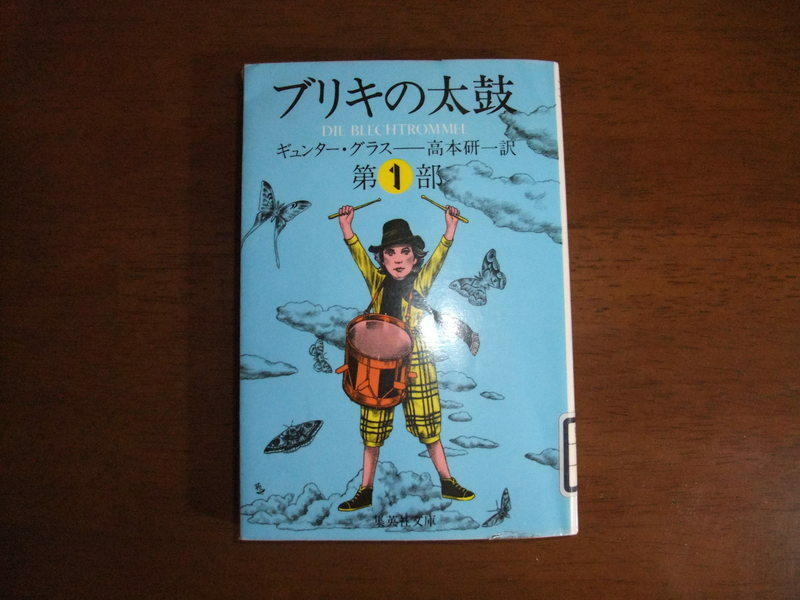 I don't know whether this translation is good, but I'll go on with the story, supposing that it's correct. The flag consists of four colors and stands for extreme resolutions. Battleship Mikasa, that I wrote about in the last entry, fought the Russian Baltic Fleet with this flag raised and claimed a perfect victory. This triumph led to the Russians' turning back and made their subject colored people awake to the fact that they're never inferior to white people. It literally changed the white-dominated world that had continued for 500 years. In this way, flag Z became the sign to show strong will in Japan. 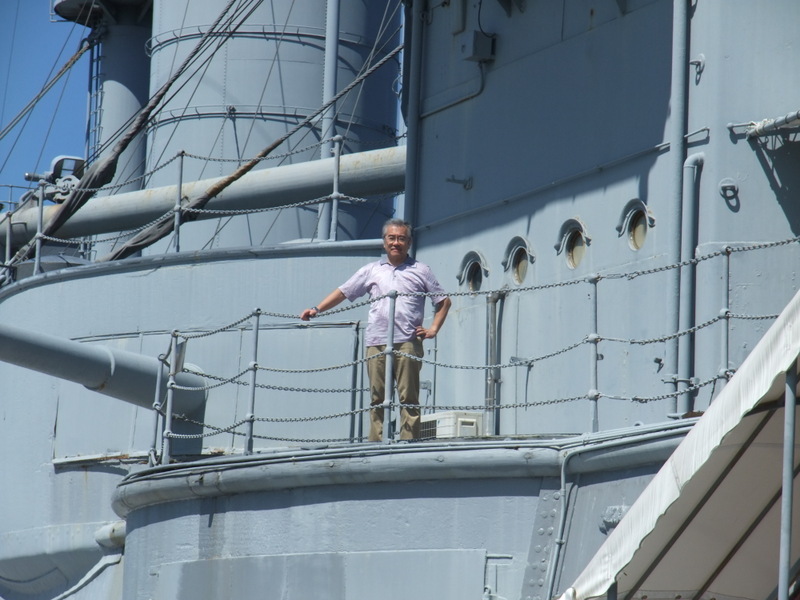 On the second day in Tokyo, I dropped in at the Battleship Mikasa Museum. I didn't know that this ship had been preserved in this way. This museum is adjacent to the U.S. Fleet Activities Yokosuka (a United States Navy base), and is big enough so that you can see it on the Google map. I've lots of things to write about this battleship and I don't know where I should start. I just want to write about the highlights. 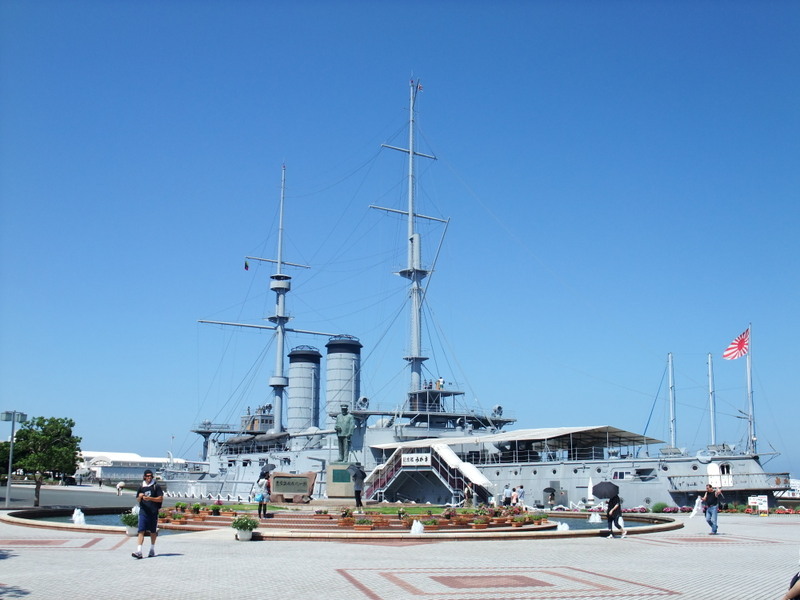 This battleship was the first steel-made battleship in Japan and was constructed in Great Britain in 1902. At the Battle of the Japan Sea in the Japanese-Russo War, this battleship worked remarkably as the flagship of the Japanese Imperial Navy. 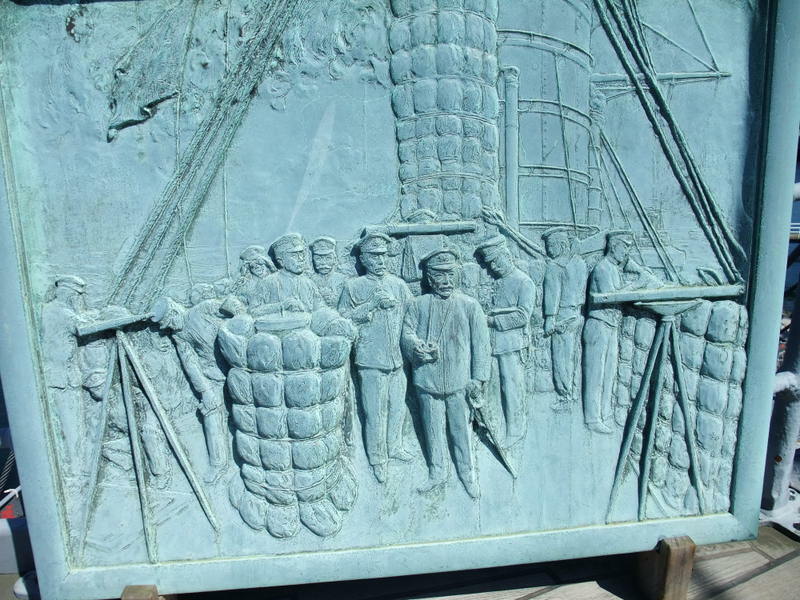 They totally defeated the Russian Baltic Fleet on May 27th in 1905. 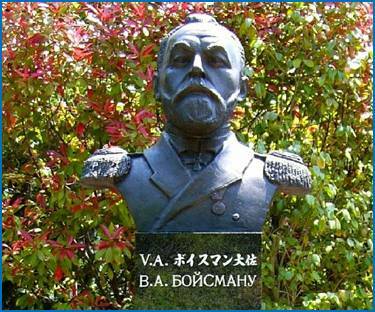 Japan staked the fate of the nation on the Japanese-Russo War that started in 1904. Russia was invading to the south at that time, so if Japan couldn't win the war, both Koreas and at least the northern half of China wouldn't exist now. Japan would also have become one of Russia's colonies. 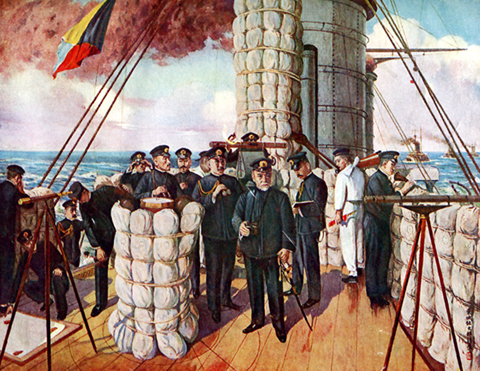 Following Japan's defeat of the mighty Russian forces on both land and sea, the war was brought to a close with the Treaty of Portsmouth mediated by the United States. Getting off track, two heros in this war were born in my hometown, Matsuyama City. They were called the Akiyama brothers. The elder was a hero on land and the younger was aboard this battleship. 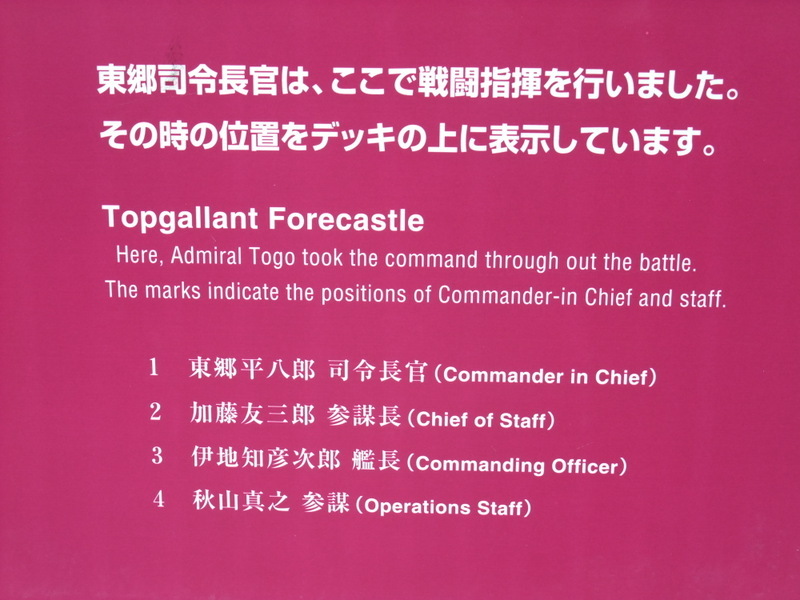 His tactics were impeccable in the battle of the Japan Sea and brought a complete triumph to Japan. A drama featuring the Akiyama borthers will open this autumn. I hope that the battleship Mikasa will appear on the screen using CG techniques or something. Getting back on track, Mikasa was retired in 1926. 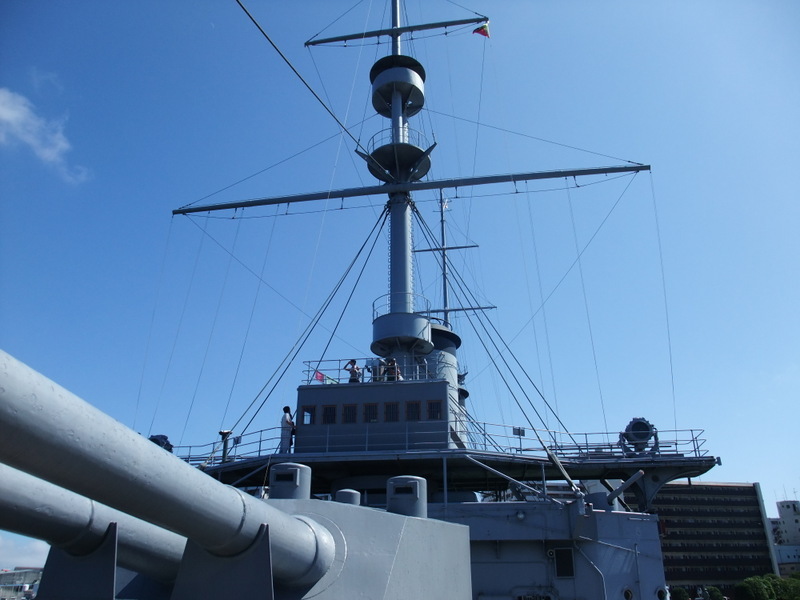 It was placed and preserved at Yokosuka City as the symbol of Japanese pride and confidence. You can see the real and neutral history inside. I'm going to write about this topic again. I went to Tokyo just for fun. When I got the air ticket two months ago, I had a task, but it vanished later. I met my eldest daughter and had a party with my acquaintances, whom I knew only on the internet. I met them for the first time, but we hit it off from the start. Their careers and present jobs were far different from mine and it made my knowledge widen. Such a meeting would offer mental and spiritual sustenance to me. 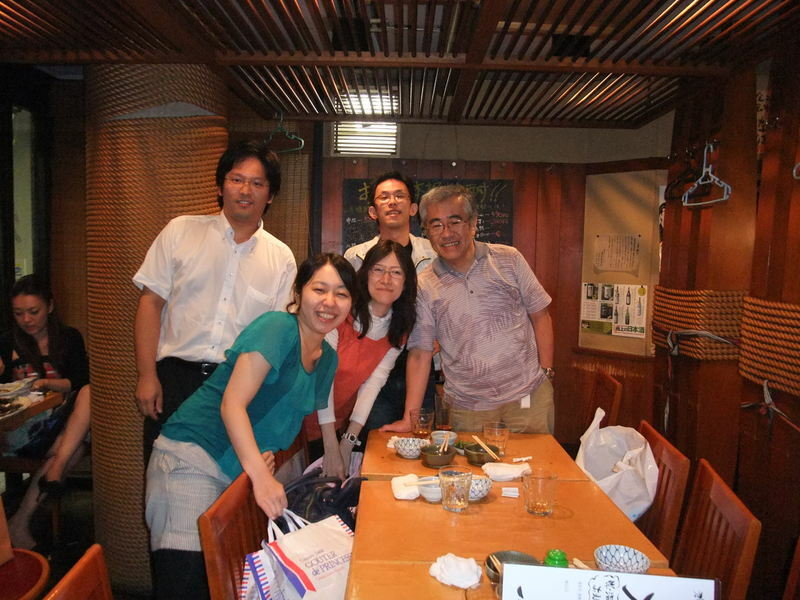 The Japanese style inn where we got together was located in one of the busiest areas of Tokyo, Shinbashi. This station is noted for the birth place of the train. The first railway track in Japan was constructed between Yokohama and Shinbashi. 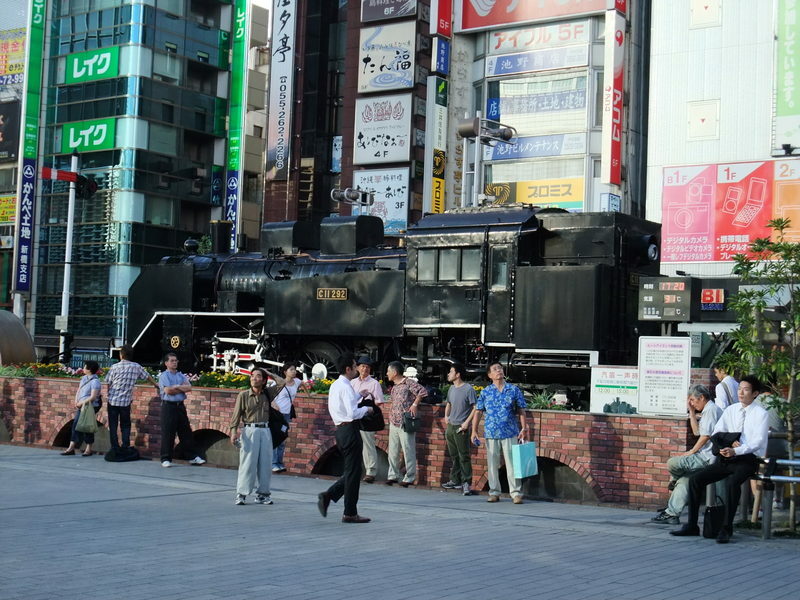 There's the steam locomotive square in front of Shinbashi station. An old locomotive is exhibited and it is often used as a designated spot. Japanese people have the virtue of modesty. Silence is better than eloquence for Japanese people and is the principle of ordinary Japanese people. After World War Two, the U.S. took advantage of this modesty and brainwashed Japanese people into believing that Japan used to be an evil country. Besides, Chinese and Korean operatives illegally slipped into Japan and are continuing to destroy the spiritual backbone of Japan like the Japanese culture, history and mentality. 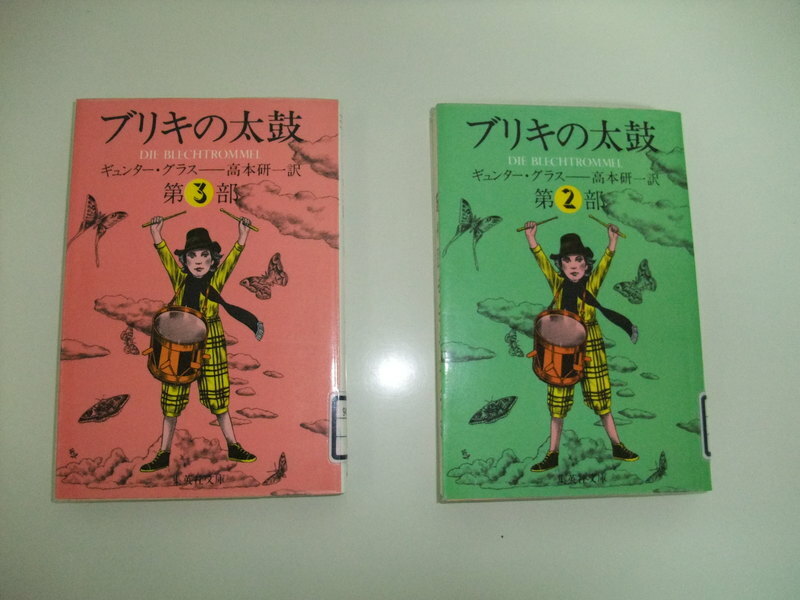 The picture shows the history textbook. It's a non-biased one. I think it's neutral and has nothing wrong with it. To my surprise, South Korea started to make complaints against Japan on the day that this textbook was presented to the public. I wondered when they checked its content. I think they accuse Japan just for the accusing itself. Anyway, we have been educated using textbooks that were authored by leftists. Consequently we have been brainwashed, of course, including me. As for me, I was lucky to find that I was controlled by leftists and could get out of their control. This new textbook in the picture was acknowledged as one of the formal textbooks. This textbook will make Japanese people awake who are now under the spell of Douglas MacArthur. 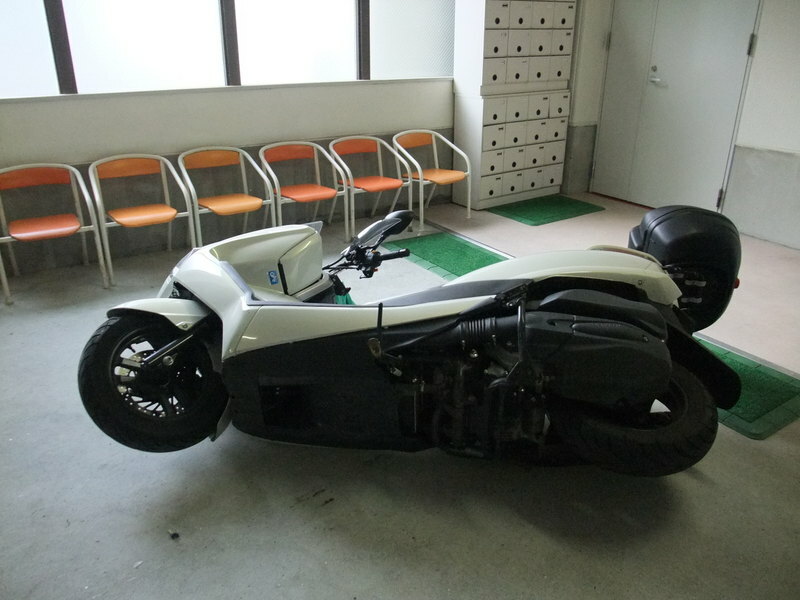 However important modesty is to Japanese people, there are limitations. We started to express our own opinions to the world and also started to want to have nuclear weapons. At the L'Aquila Summit, our Prime Minister, Aso, declared stoutly against the Russian President, Medvedev, that there wouldn't be any partnership between Japan and Russia if they don't return our northern islands. 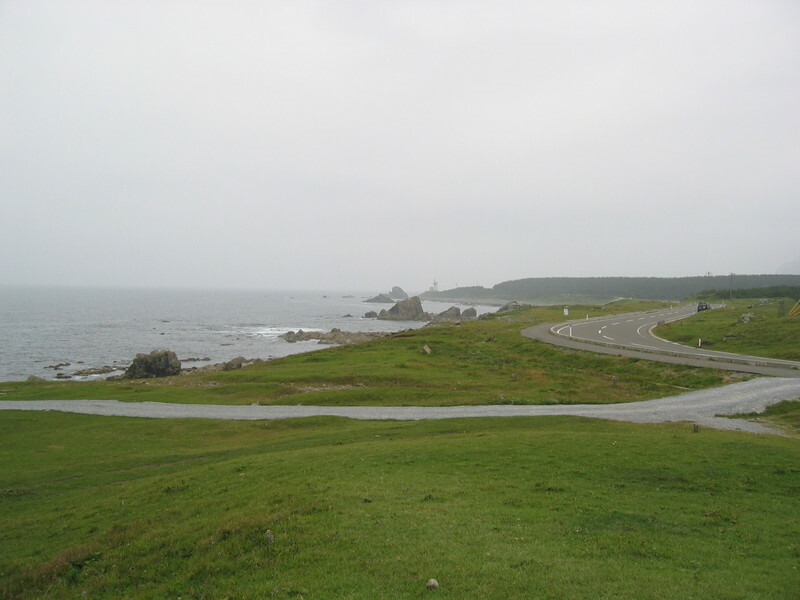 The U.S. announced that the Senkaku islands belonged to Japan, though China insisted that the islands were their land. Besides, the U.S. forced China to get hard on North Korea in order to avoid the possession of nuclear weapons. The U.S., knowing well enough the potential of Japan, wouldn't want Japan to have the button of the absolute weapon. I put a wonderful wall clock in my living room, which is controlled by radio and driven by light. It means that this watch never shows a bad time and never stops due to the outage of juice. It has worked impeccably these last two years. Besides, it's not expensive. However, I found that it's not always true that the more advanced, the better. I saw a nostalgic pendulum clock today. It reminded me of my maternal grandparent's house, which I frequently visited in my childhood. Both of my maternal grandparents have already passed away but their shadows are still in my mind. This pendulum clock made the shadows of their former selves vivid. 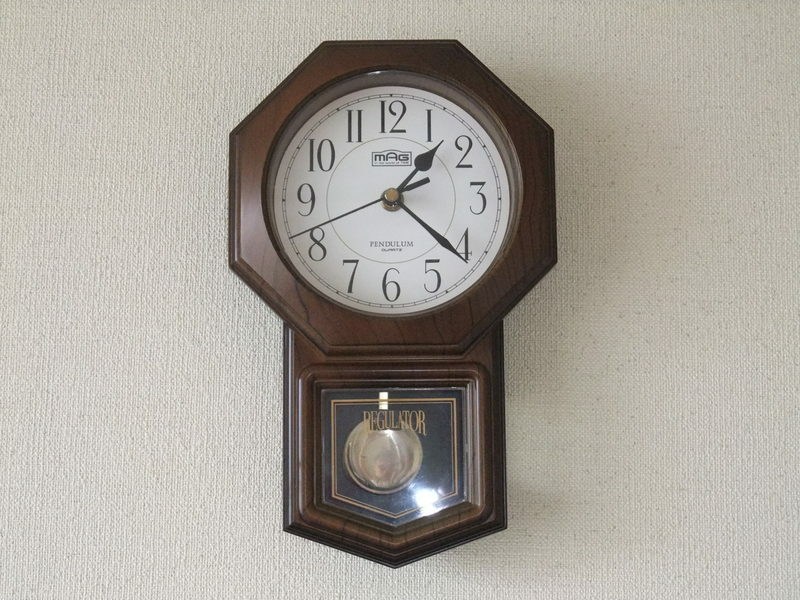 I've not seen this type of clock for a long time and I looked at it for a while and found that it said on the face "QUARTZ". What? The pendulum was a mere ornament and this clock wasn't driven by a spiral spring but controlled by quartz and AA batteries. It was just a fly in the ointment. 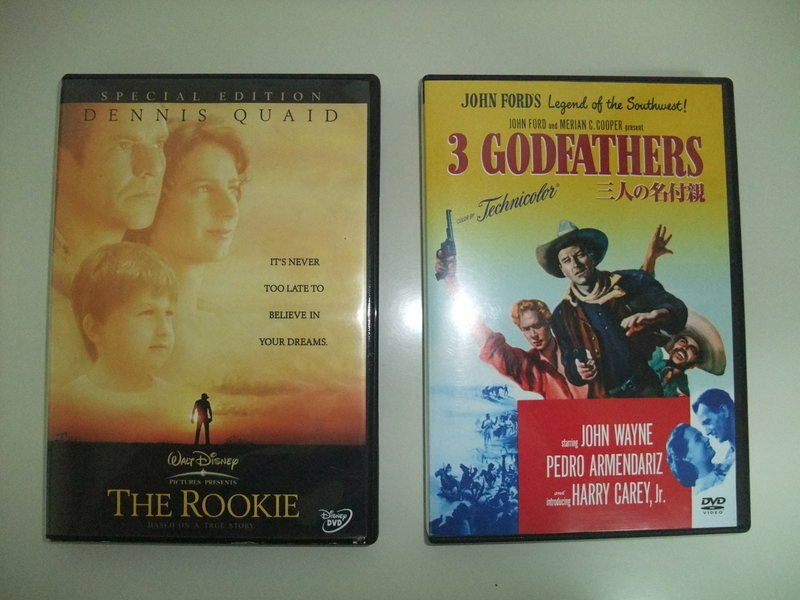 All the same, something nostalgic wasn't bad. I put on my favorite rain jacket and took off for work in the sign of rain this morning. The rain jacket was one of my climbing gears and I really liked it. I hung up my jacket on the steering of my scooter after parking it to dry it up in the garage at my office. 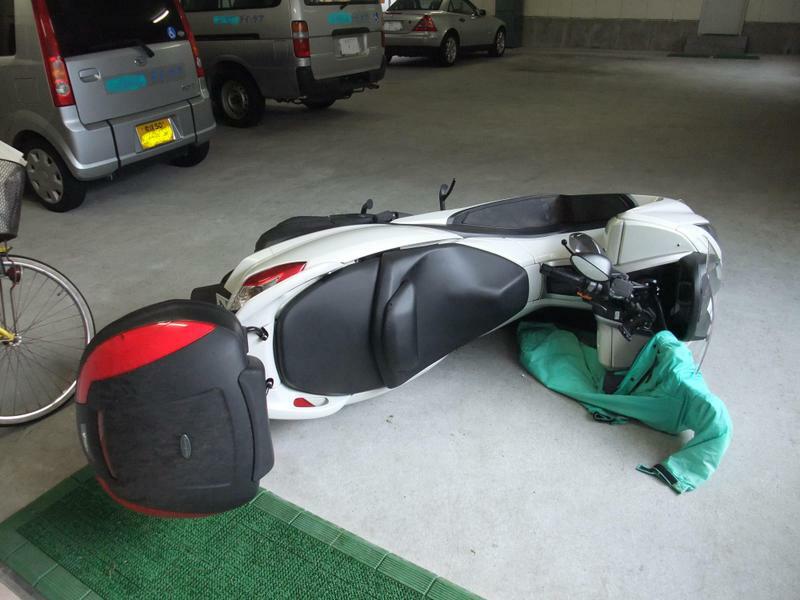 A few hours later, I was called and knew the situation of my scooter as you see in the picture. It was done by a dog that my boss kept. While a staff member was away from the dog, leaving the dog free in the garage, the dog did that. The dog seemed to have pulled my jacket on my scooter. It started to rain outside and he must have cut corners to walk the dog. 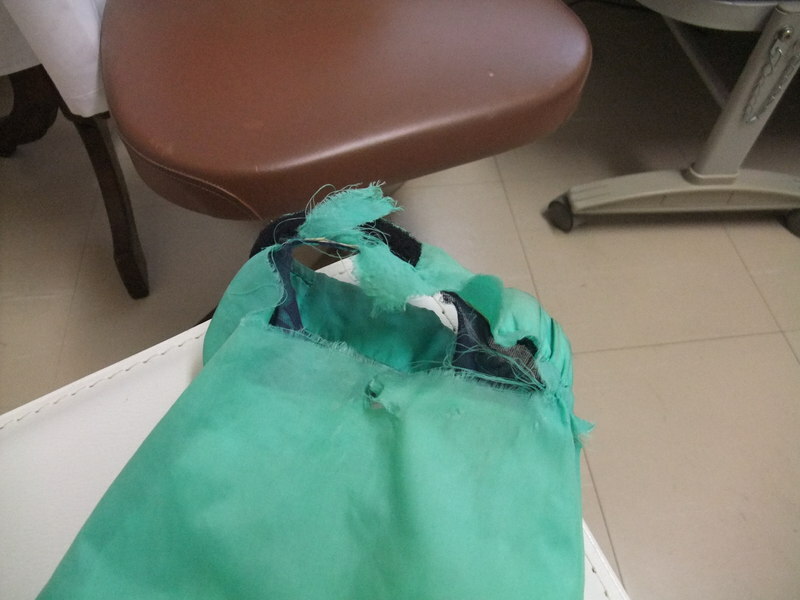 I was so upset, but that was what was done by a dog. Besides, the damage of my scooter was minimal. 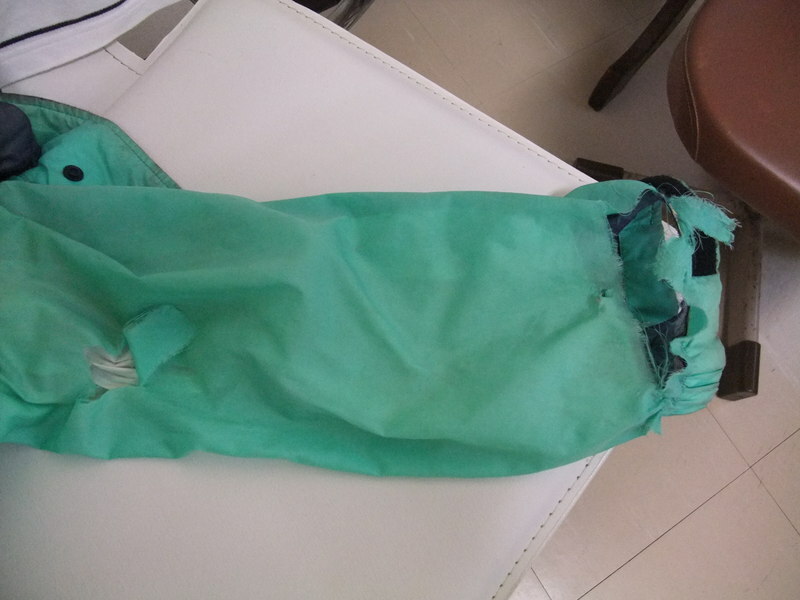 It looked like the most fragile part was protected by my jacket. However, my rain jacket was miserable as you also see in the pictures. I guess that it can't be helped. I don't know what you call a person like me who loves small gadgets such as portable GPSs, data loggers, palmtop PCs, cellular phones and so on. Gadget freak? Anyway, one of those gadgets has been always on my mind for a year. It is the Google Phone, which was unveiled in Europe and the U.S. last year. I'd been eager to see it directly and I heard a few months ago that it would be on sale in Japan in several months. I couldn't wait for the day. A few months have passed since then and today was the day when it went on sale. Needless to say, I rushed to the shop and bought it. I'll show you the picture, in which a case for the phone shows up. 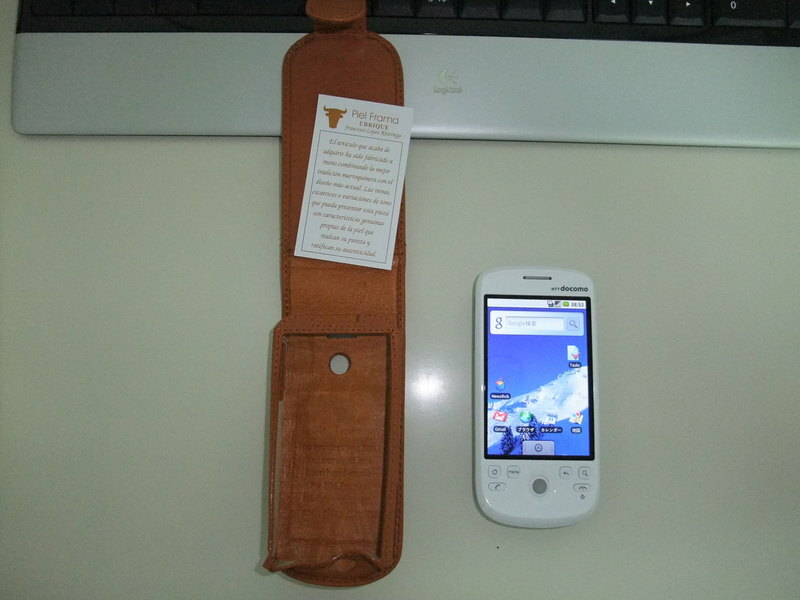 This case is made by Piel Frama and is specially designed for the Google Phone. It fits comfortably in my hand. My hometown, Matsuyama City is just in the midst of the rainy season. It hasn't rained so much, but it's terribly humid and muggy these days. I don't hate rain. Rain sometimes soothes me. When it rains and I'm off, I often spend time under the veranda with my dog over a cup of tea or reading some magazines. Leaves and trees in my garden look vivid in the rain. However, it's getting hot day by day recently and I hate humidity. Fortunately my job is in doors. I feel sorry for the people who work outside in this season.